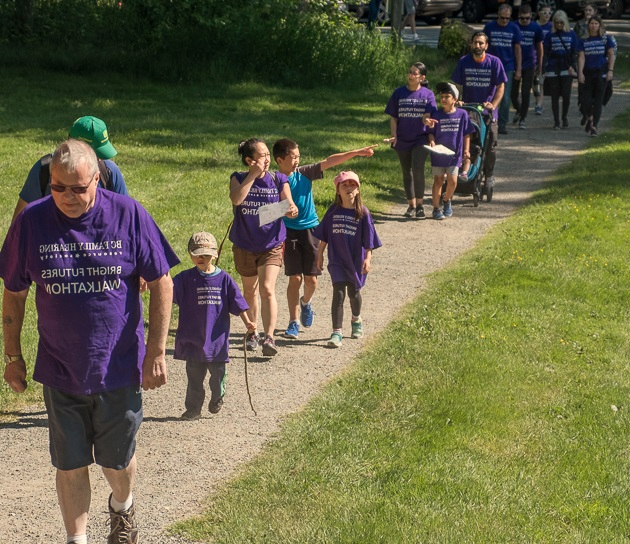 For over 15 years, the Elks & Canadian Royal Purple Society lodges of BC have hosted the annual Walk for Bright Futures in support of BC Family Hearing Resource Society. Each year families, alumni, staff, board members, Elks & Royal Purple members and friends of BCFHRC & SESLP gather for this fun event to raise funds for our organization. It all begins with an enthusiastic warm-up, led by some of the BCFHRC staff, to get everyone limbered up to walk. Then we head off into the trails to enjoy a 1.5 km or 3 km walk/run. When the walkers, strollers & runners return, there is a bbq lunch on hand along with lots of time and space for the kids to play and for the adults to relax and mingle. The 2019 Walk for Bright Futures will be held on Sunday, May 26th. Registration begins at 9:00am and the walk itself starts at 10:00am. The walkathon will be held this year at the Aldergrove Regional Park. Please join us as a walker, cheerleader or fundraiser for this important and fun event supporting BCFHRC & SESLP – REGISTER HERE.